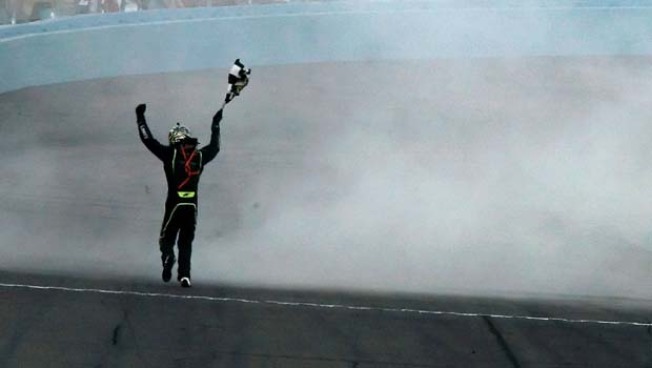 Professional driver Kyle Busch celebrates after a race. Indio police would like you to please leave the racing to the professionals. INDIO, Calif. -- A juiced-up vehicle, whose owner was convicted of street racing, was scheduled to be crushed Thursday afternoon in a display designed to discourage "a very dangerous hobby." The Indio Police Department is the first law enforcement agency in Riverside County to destroy street racing vehicles whose owners have been convicted, said Indio Police Department Administrative Officer Ben Guitron. "It's a very dangerous hobby," he said, noting that most street races course through residential areas. First, all liquids will be drained from it, then it will be placed in a hydraulic device and "flattened," said Guitron, who described the vehicle as a "juiced-up, expensive import" whose value was doubled by extensive engine modifications.